This playlist contains videos that we recommend parents use as an effective way to start an in-home discussion about digital citizenship with their children. Pick an age-appropriate video and watch it with your children. Use the topic presented in each clip to start a discussion with your children. We recommend regularly holding family nights to discuss these topics and allowing your children help you to set Internet and mobile device guidelines/rules in your home. Encourage your children to share and promote positivity in their online interactions. This resource provides information on content filtering apps, devices, and other software that can be used to help filter content or otherwise protect your children online. It is a resource provided by the us to assist parents in finding a solution that works for you in your home. 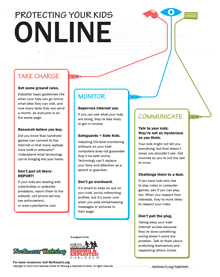 This resource provides parents with some specific safety tips and suggestions for to help keep their children safe online. It provides tips and links to software that parents might find useful in protecting their children.